The founding members of NZ-NEC were the Department of Ophthalmology, Department of Optometry and Vision Science and the Molecular Vision Laboratory (Department of Physiology) who together signed a memorandum of understanding in March 2007. In mid 2008 the Molecular Vision Laboratory will join the Department of Optometry and Vision Science. Although NZ-NEC provides a unifying platform for a common vision and goals, the two key foundation departments will continue to retain their distinct professional identities. The management team is composed of the Director, Deputy Director and the manager of NZ-NEC working closely with their support staff for the running of the centre. This group will consult and interact closely with the scientific advisory board to coordinate the overall direction of the centre, identify new initiatives, and foster collaborations between the groups. 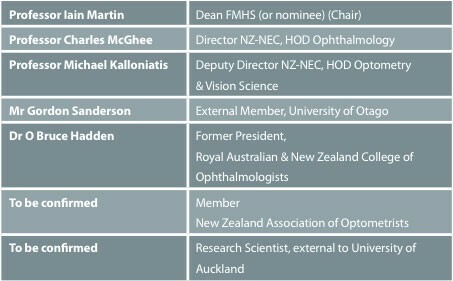 The formal advisory board for the NZ-NEC Faculty Centre will consist of seven members: Dean of Faculty of Medicine and Health Sciences (FMHS) or nominee, the Director and Deputy Director of NZ-NEC, representative members from the two professional bodies (Optometry and Ophthalmology), and members external to the organisation. A large number of research and teaching collaborations currently exist with universities and research organisations, nationally and internationally, including several links with: Argentina, Australia, Canada, England, Germany, Hong Kong, Japan, New Zealand, Scotland, Sweden, and the USA.